Free Jazz in Japan: A Personal History by Soejima Teruto is now on sale in the store!! Soejima Teruto was a film critic and jazz fan who moved from the front row to backstage in the 1960s and continued to support progressive jazz for the next forty years as promoter, label owner, critic, filmmaker, tour organizer, and more. He was present at and integral to the free jazz scene and his memoir has all of the info. All new photos not in the original Japanese edition! Introduction by Otomo Yoshihide. Public Bath Press is very proud to add this book to our catalog. 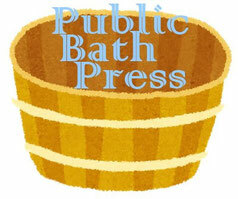 Public Bath Press is a small press dedicated to publishing interesting things about Japan. It is the successor company to the legendary indie label Public Bath Records, known to all since the late 1980s. We publish in English, while maintaining our base in Japan. By the way, all Japanese names in all Public Bath Press products are in Japanese order, family name first, given name second. UK fans can buy Public Bath Press books at Iklectic. US fans at Church of American Damage. European fans at Soundohm. Long-awaited history of free jazz in Japan, written from the perspective of a scene insider who moved from fan to critic to promoter to historian. Reprinted many times in Japan, this is the first book in English to elaborate this fascinating scene. In the 1990s, when Boredoms-mania was at its peak, Yamamoto Seiichi was asked by Guitar Magazine to write a regular column. The bulk of this book is the best of those columns, order arranged by Yamamoto-san himself. There is also much additional writing, fiction, poetry, reminiscences, etc. In addition to being the visionary guitarist of the Boredoms, Omoide Hatoba, Rovo, Most, Rashinban, and many, many more units, Yamamoto-san is also an artist, with several gallery shows to his credit. This book contains all new original art and photography (not in the Japanese version of this book). The book comes with a CD which is a remix/remake of Omoide Hatoba recordings, Suido Megane Satsujin Jiken recordings, and new recordings, for a unique, boretronix-style romp through his talents. Wajima Yusuke's history of the Japanese popular music that is almost universally considered to be traditional but that is not. A great history not just of the music, but also of the political and social climate of the postwar era, especially the 1950s and 1960s. Highly recommended. When this book first appeared, a few years ago, it was considered a radical rehistoricizing of something thought to be common sense. Common sense has since realigned itself along Wajima's lines. A complete index of names referenced in the book is available online. Check it out here. Creating Enka is available in the store for ￥2500. Shipping will be ￥180 for domestic Japan shipping, ¥580 for SAL airmail, and ¥870 for regular airmail. There have been some problems with SAL recently, but usually it is pretty fast for just one book. A Life in Folk (and other bitter songs), the English translation of legendary folk singer Mikami Kan's autobiography is now available. The book comes with a CD of Mikami live in Sapporo in February of 2017. The book is a the complete translation of Folk ni Ikiru, with additional autobiographical writing and interview material added. Regular international airmail is ¥780 for this book. Gaseneta Wasteland is now available in our store. Gaseneta was a Tokyo band of the late 1970s, the early days of indies and punk in Japan. Gaseneta played an uncompromising version of what would later be called "artcore," never repeating themselves. Their bassist, Osato Toshiharu, who would go on to study and teach French literature and philosophy, wrote this memoir/novel while living and studying in Paris. Gaseneta never recorded, but many live tapes have been issued on CD and more will be appearing soon. Anyone with an interest in Japanese indies, the Minor scene of Tokyo in the seventies, literature or philosophy will find something of interest here! The special offer of book and EP sets is now finished. Thank you to the many fans and friends who ordered that way. From now on, the book, which is still very much available, will be shipped with ￥480 added for SAL airmail, world wide. Yoroshiku! Named 2017 Book of the Year by the editors of terminal-boredom.com!!! Our first book is out and now for sale in the store!! It's time for you to read this comprehensive background to many Japan undergrounds. When it was conceived, it was to be a history of Kansai music, but Tokyo is well represented as well. 2. Taking it to an Audience in Tokyo, or, Do You Wanna Be My Doggg? Show 会　scenezine 1991 in store! Show会　was a one time only magazine about the music scene of Osaka in 1991. Actually, there were plans for more issues, but it was too much work and with the limited technical skills of the staff of one (not much improved in the last 25 years) it never happened again. Some of the music that was included on the cassettes is available if you search discogs and/or youtube. It's a time capsule, and, as such, it has its charms and its formidable shortcomings. At less than a dollar, it's probably worth every penny. Go to the store for information about downloading, which is also primitive technically!